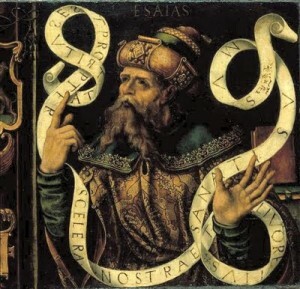 In February (2015) the Charlotte Observer, in its Voices of Faith section, asked its religious columnists to answer the question, “Why is Isaiah your favorite prophet?” The newspaper published two responses — one from a Unity Temple reverend, and one from a Mormon Seventy. The Unity clergyman gave two reasons for choosing Isaiah as his favorite prophet: 1) Because two people he loves have the name Isaiah; and 2) Because the prophet Isaiah understood and taught the law of cause and effect. When the Mormon Seventy answered, he didn’t actually say that Isaiah is his favorite prophet (and I’m fairly certain that he is not), but Elder Deshler seems to hold Isaiah in high esteem. His answer to the question began with a statement straight out of the Mormon proselytizing handbook: “Throughout time, God has called prophets to act as his messenger and make known his will to the people. Additionally, prophets are called to preach righteousness and to testify of Jesus Christ.” Mr. Deshler noted that Isaiah’s teachings include now-fulfilled prophecies about the birth, mission, death and resurrection of Jesus Christ, as well as “powerful truths that are relevant to guide our day-to-day actions toward others and the deity.” These are things like avoiding worldliness, fasting for the poor, and keeping the Sabbath day holy. When I read Isaiah, I see the sweeping story of God’s judgment on, and deliverance of, His people Israel. What I don’t see when I read Isaiah is Mormonism, the Mormon Church, or the Mormon prophet Thomas S. Monson. Elder Deshler reads Isaiah and finds superficial support for Mormonism and Joseph Smith’s Restoration. 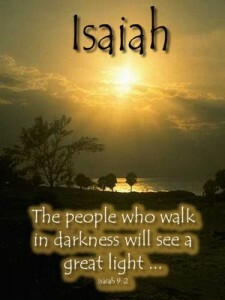 God’s people read Isaiah and see God. This entry was posted in Bible, Great Apostasy, LDS Church, Prophets and tagged Bible, Church of Jesus Christ of Latter-day Saints, God, Isaiah 43:10, Mormon Church, Mormon Scripture, Mormonism, Prophets. Bookmark the permalink. how can they conclude that “in little more than a year” refers to a great “apostasy that would occur following the death of Jesus and his apostles”? I’m not that good at math, but it looks like Isaiah was prophesying something that would occur soon, while the Mormons read the same verse and see something happening 700 years later. Am I missing something here? I dont see how any mormon in true honesty can say they like any book of the Bible. How can they really know if it is true and says what it means if they keep running around claiming the Bible is not translated correctly. If these guys believe these books or verses are translated correctly, then they need to be removed from the J.S.T If they are not correct, then how can they trust them? Either way they have a problem. Isn’t it funny how these Mormons can make the Bible say what they’d like it to say? Oh maybe not so funny. Mormons are among the most uninformed, ill-equipped people to do any type of Biblical interpretation. But then Joseph Smith came-up with his own translation of the Bible and did it without knowledge of the language it was written in or without any ancient manuscripts. I don’t think the guy even bothered to put his magic rock in his hat for this particular task. Well as long as it makes you feel good it must be true. historybuff, you’re not missing anything . Isaiah 32 is not talking about the Mormon invention of a complete/ universal apostasy of Jesus’ church and from the gospel of salvation His apostles preached. Elder Deshler wants people to think that this chapter of Isaiah is teaching a fundamental Mormon doctrine . He fails miserably . Here’s the problem with Mormons and the Bible. They take their Mormon belief system, which was formulated out of whole cloth, and then over-lay it on the Bible. Then they claim to have Biblical support for what they’ve created. Now these are the same people, remember, who say the Bible is corrupted and can’t be trusted. Any number of aberrant and heretical religious sects do the same thing. The Jehovah Witnesses come to mind. But in their case they actually changed John 1:1 to turn Jesus into a created being rather than God incarnate. There are basic principles of Biblical interpretation but these groups aren’t interested in that. They want to use “revelation”, which is basically any thought that meanders through their mind. This serves as their primary means of Biblical interpretation. In their twisted thinking, this is far superior to actual scholarship. What Mormon authorities have claimed about their universal apostasy doctrine is a clever and convenient way they can gain an audience and seek to convince people the Mormon church is the one true of Jesus Christ today . Some of the teachings Mormon leaders have taught are so strange that the only way they can convince people that they have been appointed and supervised by Jesus is to start their proselytizing message by saying that a complete apostasy occurred soon after the deaths of Jesus’ apostles . This resulted in the gospel they preached being altered by men who added their man made teachings to it thus rendering it ineffective , so according to Mormonism salvation became unavailable to man on earth for 1700 years until 1830 when Joseph Smith appeared on the scene and completely restored the gospel of salvation in it’s purity . This then is the claim of Mormonism. We should expect latter days false prophets to hatch a story like this , it can afford them a better chance to gain an audience . Mormon Elder Mr Deshler has been trained by his colleagues to find the Mormon doctrine of a universal apostasy of Jesus’ church and gospel in the Book of Isaiah . So he makes an attempt to find it in Ch 32 . But this ridiculous doctrine is’nt in Isaiah and it’s not in the New Testament either , but false prophets are good at finding things in the scriptures that they can manipulate and turn into ” Bible truth ” . It’s important that any non Mormons reading this blog understand just how ridiculous some of the claims Mormon leaders have made . The Mormon doctrine of a universal/complete apostasy of the church Jesus established through His apostles and from the gospel of salvation they preached is at the top of that list of claims . Mormon leaders have officially taught that as a result of a complete apostasy ” Christianity sickened and died ” ! [ Apostasy and Restoration , 1983, p.9 ] . [ Mormon leader George Q. Cannon , Gospel Truth , v2 p 324 ] . In addition to these ridiculous claims ,Mormonism teaches that the true gospel of salvation was altered by evil men soon after the death of Jesus’ apostles making salvation unavailable to man on earth for 1700 years until Joseph Smith appeared on the scene claiming authority from God to make it available again . [Mormon General Authority Bruce McConkie , Mormon Doctrine , p 396 ] . Salvation not available to mankind for 1700 years ! Why would anyone take Mormonism seriously once they heard that ? It’s truly a ” out there ” type of belief . It’s our prayers that the Mormon people will discover that fact soon .